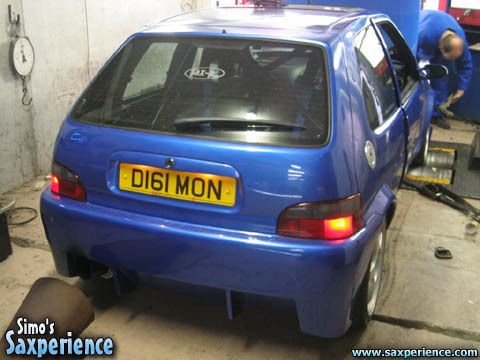 November 2004... 190bhp at the wheels! Whilst my car was at GMC Motorsport with the gearbox in pieces, it became evident that the AP Racing clutch cover, which I had fitted a couple of years before was on it's last legs! The end tips of the pressure plates had worn to less than 1mm in thickness. It made sense to fit a new clutch whilst the gearbox was off the car, rather than take the gearbox off the car again in a few months time. The choice of clutches, which could cope with the power the engine was producing was not too extensive. 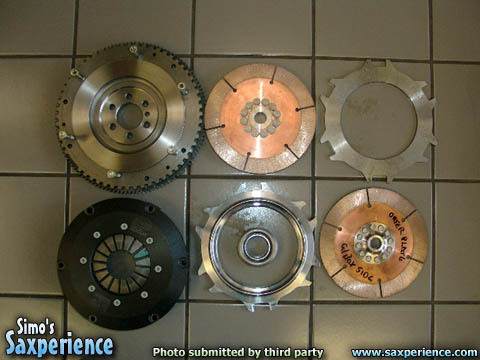 The simplest options were the AP lug-drive clutches, which GMC Motorsport had already proven on their supercharged Saxos. I opted to fit the twin-plate AP Racing lug-drive paddle clutch, which offers a little less pedal-weight than the single-plate clutch. The flywheel had to be machined slightly to enable the clutch to fit within the housing correctly. Before re-assembling the transmission, a genuine Citroen driveshaft was also ordered to replace the after-market driveshaft, which had been re-mangled on the morning the crown-wheel eventually died. With the car back together, I asked John Dobson to put it through it's paces on the rolling road and remap the fuelling, which had not been looked at since fitting the new 4-branch stainless steel manifold. Whilst performing the rolling road tune a bizarre fault occurred, which meant the car would not fire... at all? 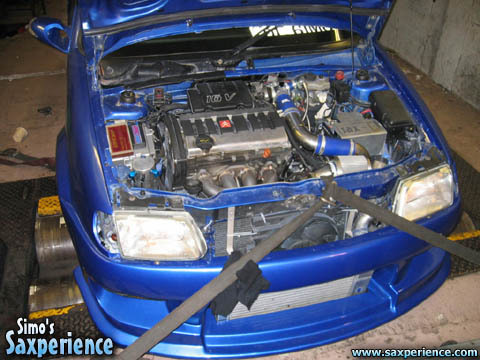 After checking all of the wiring, etc the fault was eventually diagnosed as a blown ECU! A replacement ECU was ordered and all was well once more... on with the fuel mapping! The engine was again producing decent power, at only 0.5 bar of boost. A number of power runs were performed with bhp figures being recorded after holding the engine under load for a few seconds at specific rpm points. The peak power observed was 190.4bhp at the wheels, which equates to approximately 240bhp at the flywheel (dependant upon which transmission % loss you care to use?) The original plan was to increase the boost slightly to see how the bhp would increase, however upon inspection of the engine bay whilst on the rolling road a significant restriction was observed, which meant that more boost would not be sensible! The exhaust manifold glows red hot under load, which clearly demonstrates a restriction in the exhasust system... the Garrett T2! In order to run more boost pressure safely and reliably, some back pressure would need to be removed. Two options spring to mind... an external waste gate, or a higher flowing turbocharger! 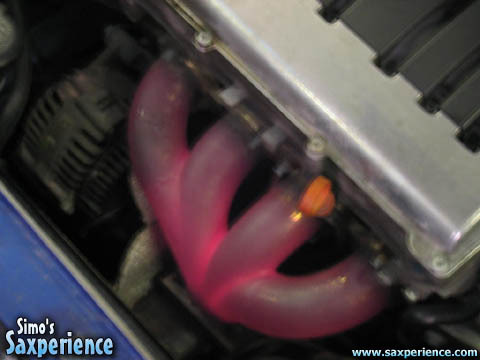 That is a seriously hot manifold!